One of the valuable feature of a real-time operating system is the ability to count and then to take action at certain defined values of an associated counter. Most RTOSes count only a single independent variable, time, denominated in the unit of time each tick represents. But the RTXC Quadros RTOS provides a more flexible approach to counting because time is not the only independent variable one is likely to encounter in a real-time system. The RTXC Quadros RTOS certainly accommodates time, represented by periodic events, but it can also handle aperiodic events that represent independent variables such as angular rotation or flow. Why is this important? Imagine having to keep track of rotational speed of an automobile’s engine or the volume of fluid flowing through a positive displacement meter with only time as your independent variable. All sorts of transformations would be required, each with its own built-in errors. But if there were a tick representing increments of angular displacement, measuring angular velocity or RPMs on an engine is significantly easier. Likewise, if each tick from a PD meter represented some known volume, flow rate and volume become very straightforward and more accurate. To allow more degrees of design freedom to system developers, the RTXC Quadros RTOS uses a hierarchy of classes to count and keep track of ticks. At the highest level in the hierarchy, there is an Event Source, representing some base count frequency. One or more Counters can be associated with the parent Event Source. The user defines the units of the Counter and the number of Event Source ticks that represent one Counter tick. In this way, it is easy to divide down a higher frequency into a lower one. Using time as an example, an Event Source might provide a fixed rate of 1000 ticks per second (1 kHz), which would allow a counter representing 1 millisecond if each Event Source tick was treated as a Counter tick. And if another Counter associated with that same Event Source used 1000 Event Source ticks as one Counter tick, its units would be denominated in seconds (1 Hz). Thus, if a Counter is incremented at a regular rate, then it can represent time. Normally, the units are milliseconds but others are possible. And the Counter doesn’t have to start at zero. A task can set up a Counter to begin counting from a specified base value, making a time base such as Base Universal Time very simple to achieve. Many applications need to know the number of ticks that occurred between two events. Two kernel calls are required: the first to establish the starting value and the second to get the number of ticks (from whatever counter) that have elapsed between two events, returning the difference in number of ticks from the initial event. Some RTOSes must continually poll their counters to check the value. The RTXC Quadros uses an Alarm class for generalized counting management as the third member of the counting hierarchy. This solution allows any Counter to be the parent of an Alarm with its units denominated in the units of the parent Counter. Thus, both periodic and aperiodic alarming is possible. If you need an alarm every 0.5 litres of volume flowing through a given meter without regard to instantaneous flow rate, having an alarm to tell you when it occurs is a real improvement over some traditional RTOS capabilities. The concept of alarming, however, is rather simple. 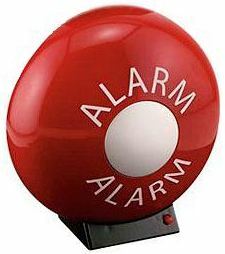 An Alarm is defined to occur at a particular value of an associated Counter. When the counter reaches the value that matches the expiration point of the alarm, an action can take place, such as resuming a task that was waiting for the alarm to expire. One-shot Alarm: An Alarm that is defined for one and only pone point of expiry, upon which the alarm becomes inactive and can only be re-armed by explicit action via a kernel service before it can be used again. Cyclic Alarm: An Alarm having an initial period and a recycle period. The first point of expiration is at the end of the initial period, after which the Alarm is automatically reset to the recycle period for each expiration thereafter until the Alarm is cancelled. At the expiration of an alarm, whether one-shot or cyclic, it is possible to synchronize that event by resuming a task waiting for that event, signaling a semaphore, etc. The expiration of an alarm can also cause a RTXC Thread to be scheduled directly or indirectly. Through these synchronization mechanisms, it is not necessary to spend non-productive processor cycles polling the alarm to see if it has expired. As a result, a deterministic response to an alarm expiration is possible. No special CPU resources are required for alarms or their associated counters. In fact, it is possible to define an internal event as the system tick event. The counting hierarchy does not distinguish between an event tick from an internal or an external source. Obviously, most applications make use of some sort of periodic interrupt for the system time tick. It is up to the user to define the source of such a tick.